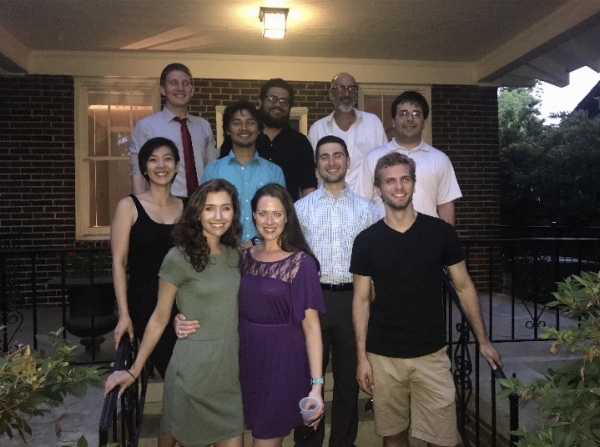 Many congrats to all of this year's graduates - Julia, Nic, Nathan, Camron, and Jose! Congratulations to Dr. Amaya and best of luck at UC Irvine! Lab alum Megan Mitchell (now at CU-Boulder) was awarded a prestigious NSF graduate research fellowship! Many congratulations to Dr. Jose Amaya who successfully defended his dissertation! 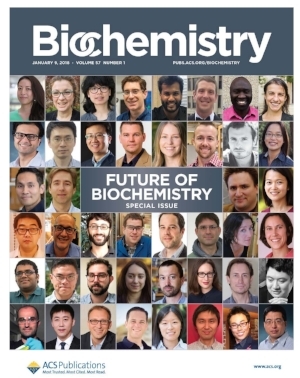 The lab was featured as the "Future of Biochemistry" by Biochemistry (ACS). Jose, Nic and Cooper contributed a nice manuscript as part of this special issue that can be found here. Jason Hsieh, a graduate from the group, was awarded a leadership development award from the American Chemical Society! Congratulations to Steven Ratigan, who successfully defended his doctoral dissertation! Welcome to Suman Das, a new graduate student to join the group. Congratulations to Veda, who shared a best poster award for her summer research in the lab and was supported by ACS SEED program. Together with Prof. John Ferry, our NSF grant "SUSCHEM: in situ oligomerization to immobilize contaminants in groundwater" was awarded funding. We look forward to continued studies with the Ferry group. Many congratulations to Job Grant, who successfully defended his PhD today! Welcome to Veda Lightfoot, a high-school student that is spending the summer in the laboratory through the ACS Project SEED program. Great funding news. An Aspire I award was awarded for O2-dependent mechanisms of C-C bond cleavage. An ASPIRE III award with Dr. Greytak for the purchase of an isothermal calorimeter. Finally, an Aspire II award with Dr. Qian Wang and Dr. Guiren Wang was also awarded. Thank you to the Office of Research for their support of new research infrastructure and directions! Awesome showing at this year's Discovery Day. Great posters and awards for Nic, Julia, and Gabriel. Links to all of this year's awards can be found here. Congratulations to Julia, who won the Fundenberg undergraduate biomedical research award. Nic and Julia won a Magellan scholars grant for "Structural and functional studies of Cytochrome P450 (CYP152) enzymes towards Sustainable Biofuels"
Congrats to Courtney. Her paper on nikkomycin biosynthesis was published in ACS Chem. Biol. Olivia Manley, a first year biochemistry graduate student, has joined the group. Job and Megan's paper on OleT Compound II appeared in PNAS this week. Congrats! Congratulations to Jason Hsieh, who successfully defended his PhD dissertation. Many congrats to Megan, who graduated from the USc Honor's College. All the best in graduate school in Colorado! Congrats to Himabindu Vinnakota, Cooper Rutland, Julia Bian, Megan Mitchell, and Aubrey Brockmiller for an awesome showing at USC discovery day. They won two first prizes (Megan and Cooper) and one second prize (Aubrey) at this year's event! Congratulations to Job Grant who was a recipient of a Fall 2015 Joseph W. Bouknight Teaching award. Congratulations to Jose and Cooper. Their paper "Mixed regiospecificity compromises alkene synthesis by a cytochrome P450 peroxygenase from Methylobacterium populi" was published in the Journal of Inorganic Biochemistry. Tom has received a CAREER award "CAREER: Mechanism of Cytochrome P450 Alkene Biosynthesis" from the National Science Foundation. Information can be found here. Congratulations to Jason Hsieh, who received a SPARC Graduate Research Grant for his project "Leveraging P450 Enzymes for Renewable Bioenergy Production". Welcome to Nicholas Leschinsky, an undergraduate from the South Carolina Honor's College, who has joined the group! Congratulations to Cooper Rutland, who received a Magellan Scholars grant for his project "Enzymatic activities of P450 BSbeta mutagenic forms for Biofuel Applications." Congratulations to Aubrey Brockmiller, who received a Magellan Scholars grant for her project "Porphyrin Heme Substitution in Escherichia coli for NRPS Mechanisms."